Use gradients as color fills that blend smoothly from one color to another. Use a CSS gradient anywhere that you can use an image, such as for the background of an element, an element border, or a mask. Because gradients are resolution-independent and compact, a line or two of CSS can replace hundreds of kilobytes—or even megabytes—of graphic imagery. 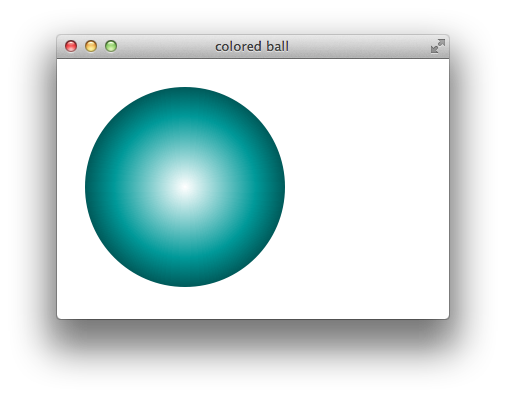 Unlike graphic images, gradients have no inherent size, and automatically expand to fill a container. 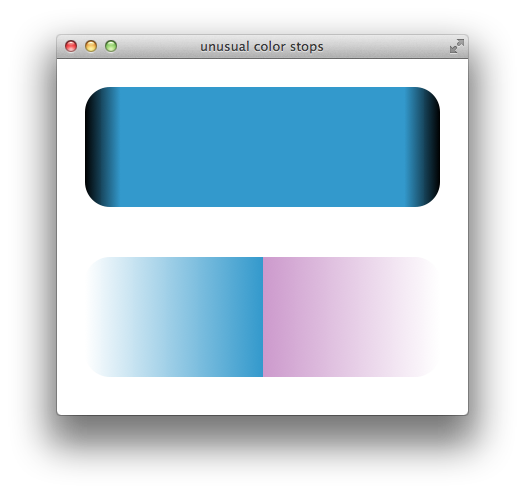 To create a gradient, specify a starting color and an ending color, and optionally intermediate colors and a direction. Safari supports two types of CSS gradients: linear and radial. This chapter describes both types of gradients. Safari 5.1 on the desktop and Safari on iOS 5.0 use the -webkit- prefix for specifying gradients, but otherwise conform to the 17 February 2011 working draft for CSS3 gradients: http://dev.w3.org/csswg/css3-images/. Note: Recent drafts of the W3C proposal have simplified the syntax. This chapter describes the most recent implementation shipping in Safari. You should expect Safari’s syntax for gradients to continue to change as the W3C standard evolves. While new syntax is expected, the existing syntax—and prior syntax—should still work. 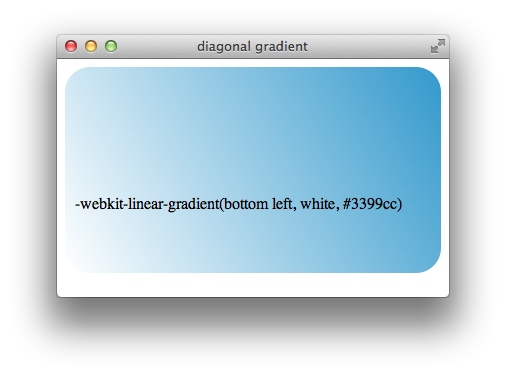 The -webkit-linear-gradient and webkit-radial-gradient properties require iOS 5.0 or later, or Safari 5.1 or later on the desktop. 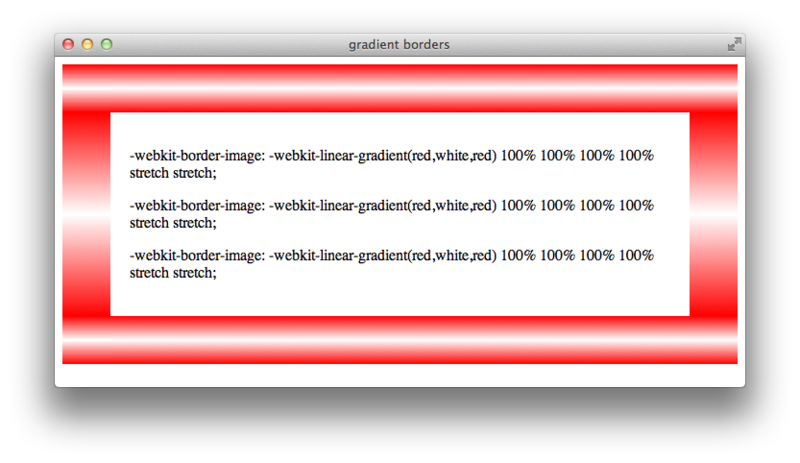 If you need to support earlier releases of iOS or Safari, see Prior Syntax (-webkit-gradient). defines a linear gradient that starts as aqua at the top of the element and ends as white at the bottom of the element. The gradient fills the element completely, as Figure 1-1 illustrates. 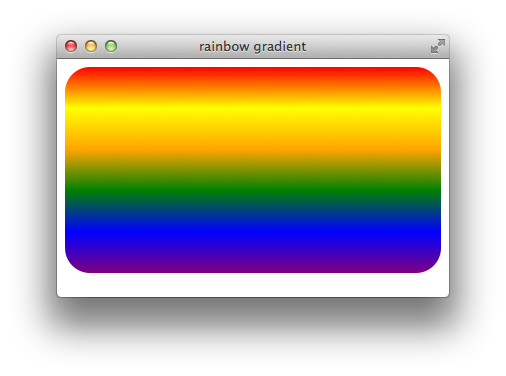 defines a rainbow gradient as a background. Apply this style to a div element, and the element is drawn with a rainbow background, as Figure 1-2 illustrates. creates a horizontal gradient going from left to right. 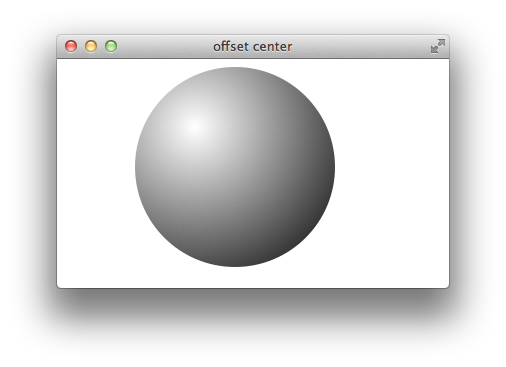 creates a diagonal gradient from bottom right to top left. creates a gradient at a 45 degree angle up and to the left. Note: If you specify a gradient from corner to corner, the angle of the gradient changes if the parent element is resized and the shape of the element changes. Specify the direction in degrees to create a gradient with a fixed angle. 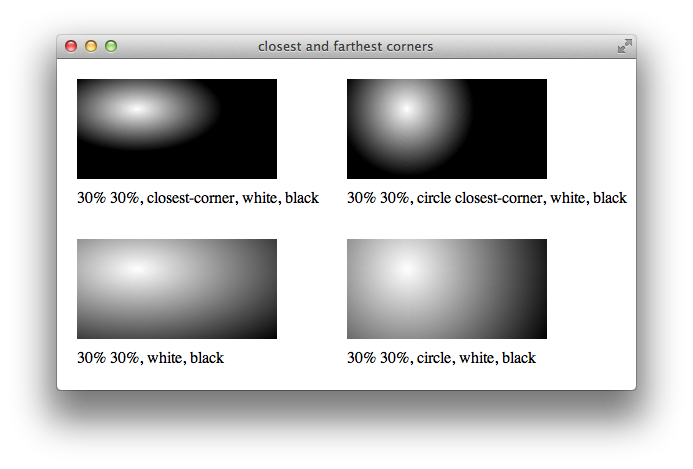 Figure 1-3 shows a diagonal gradient starting at the bottom left corner. Figure 1-4 shows such a gradient. Color stops can create some striking effects. For example, specify the same color at two consecutive stops to create a band of solid color, or specify two different colors at the same percentage point to create an abrupt change in color. 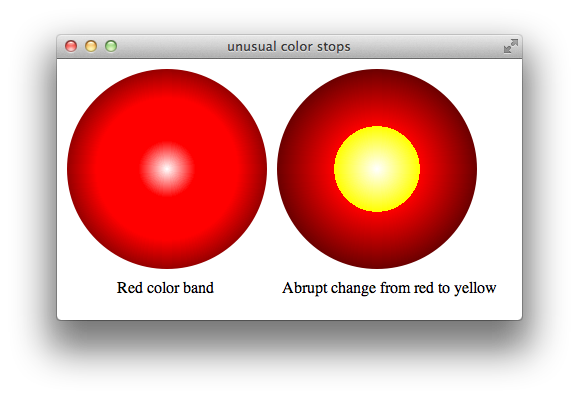 Figure 1-5 shows the effect these kind of color stops create. 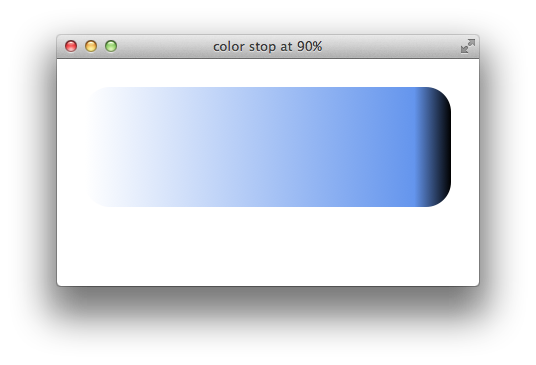 Use RGBa colors in a gradient to soften or fade colors into the background by decreasing the alpha value of the gradient. For example, Listing 1-1 creates a div element with a white background that fades to transparent. Two consecutive white color stops are used, so the div element’s background stays white for 50% of its width and then fades into the background of the element’s parent. Figure 1-6 shows the result. A radial gradient is a color fill that blends from one color to another with the color change proceeding radially, forming a disk clipped by the shape of the element. The disk can be a circle or an ellipse. Specify a starting and ending color, and optionally specify intermediate colors. The starting color begins at the center of the disk, and the color change proceeds outward until the ending color is reached, by default at the farthest corner of the element being filled. Note that the shape of an element clips a circular gradient just as it does an elliptical gradient. Notice that you specify the vertical and horizontal offsets are as a distance from the top and left edge of the element, and that you specify both offsets as part of a single comma-delimited parameter, separated by a space. If you specify only a single value, Safari treats it as a vertical offset. creates a radial gradient that begins 30% to the right and 10% below the upper-left corner of an element, and reaches its end color at the closest corner. It’s tedious to specify the color stops repeatedly when there are many repetitions, particularly if you need to calculate cumulative percentages for each color stop. 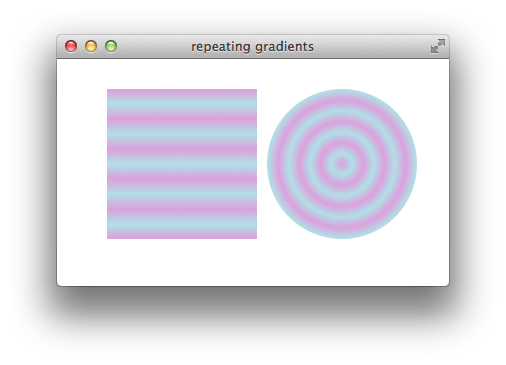 To simplify the process, use the repeating gradient properties: -webkit-repeating-linear-gradient and -webkit-repeating-radial-gradient. To create a repeating gradient, specify the first set of color stops with percentages; the gradient repeats the pattern of color stops, keeping the percentages proportional, as needed to reach 100%. The syntax for repeating gradients is otherwise identical to nonrepeating gradients. The following snippet specifies color stops that fill 20% of two gradients, which creates linear and radial gradients with five repeating plum-to-powderblue-to-plum blend stripes, as Figure 1-15 illustrates. Note that the color pattern repeats from the starting color, so if the last color specified is the same as the starting color, the pattern repeats smoothly. If you specify a pattern whose last entry is different from the first entry, the color changes abruptly from the last color to the first color when the pattern repeats, instead of blending smoothly. You can use a gradient anywhere you can use an image—as you would expect, this means you can use a gradient as a border image. However, the syntax is nonobvious. The border-image property uses four values to specify offsets for slicing the image into the top, bottom, and sides of the border. Since a gradient has no inherent size, a pixel or percentage offset into the image is meaningless; the only useful value is 100%. To make tiles from a linear gradient so that the border edges have the same color everywhere the tiles meet, start and end the gradient with the same color. For example, the following snippet creates a border like the one that Figure 1-16 shows. 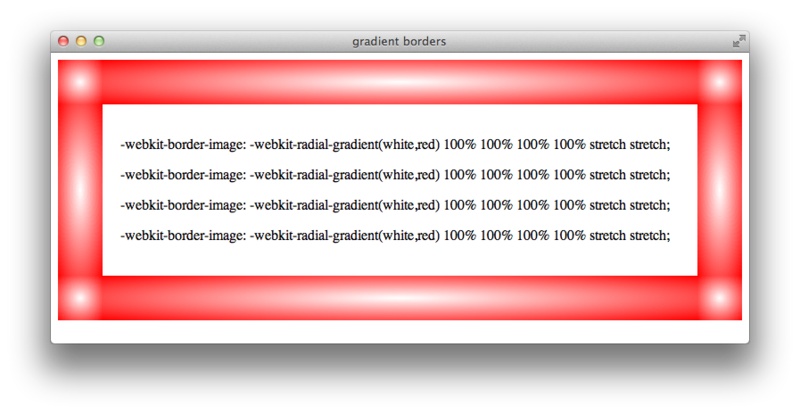 Radial gradients work nicely as borders, because the outer edges of all the tiles typically match when the stretch value is used for the repeat parameter. Figure 1-17 shows the result. 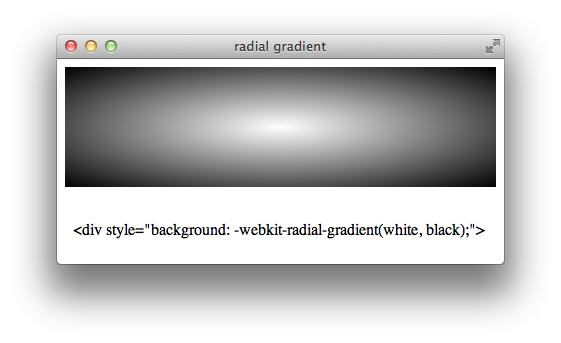 The -webkit-linear-gradient and webkit-radial-gradient properties require iOS 5.0 or later, or Safari 5.1 or later on the OS X. Specify linear gradients using the keyword linear, followed by a starting point, an ending point, a starting color with the keyword from, any color stops, and an ending color with the keyword to. 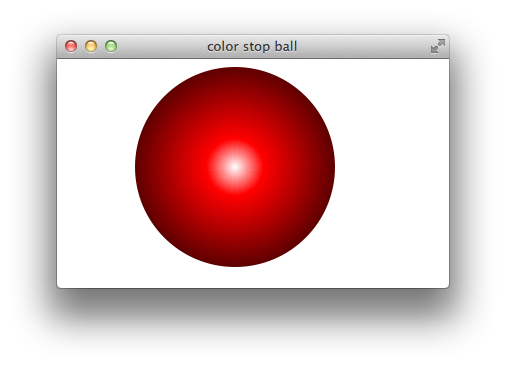 Specify radial gradients using the keyword radial, followed by a starting point, a starting radius, an ending point, an ending radius, a starting color, any color stops, and an ending color. The beginning radius specifies the size of the disk at the center of the gradient. The ending radius specifies the size of the disk at the end of the gradient. The gradient is circular if the beginning and ending center points are the same, elliptical otherwise. The gradient is clipped by the shape of the containing element if the ending radius specifies a larger disk than the element can contain.